The novel break-through technologies of the cordless, disposable THERMOCEPS™ thermal cautery makes precise cauterization available in emergency rooms, surgery centers and hospital operating rooms. The THERMOCEPS™ is perfect as a new product for emerging markets and military front line applications. This GAME|CHANGING new device offers true dynamic reimbursement for the full cost of providing an energy solution for surgical cautery and hemostasis. Facility providers are finally released from carrying the high costs of Electrical Generator Units by placing in the surgeon’s hands a more effective, battery powered, vessel sealing and ablation device. This new invention eliminates all exposed electrical current flow, uses no grounding pads or cumbersome locking jaw bi-polar RF forceps. The novel sealed electrical design assures safety by eliminating all aberrant open sparks, exposed flames and smoke. The INSTANT-ON action, of new Silicon-Nitride Heaters means faster surgical completion times. The incorporation of the newest light weight, lithium polymer batteries allows the physician to easily use the THERMOCEPS™ as both a vascular pick-up and a vessel sealing instrument. The cordless/wireless design eliminates cables and wires from the surgical field. Internal thermistors measure the heat energy at the sealing site to maintain safe, low temperature welds and vessel seals. 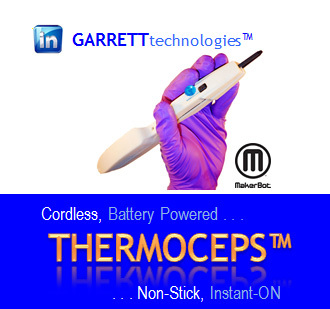 The invention of the THERMOCEPS™is a tale of medical care awaiting the successful integration of two new technologies; lithium polymer batteries & advanced ceramic heaters. In 1988, Dr. Herzon had just completed his fellowship in Head & Neck Cancer Surgery at Northwestern Memorial Hospital inChicago and was called to the ER to see his post-operative patient with a severe hemorrhage on the fifth day following laser tonsillectomy. The patient was indeed, the surgeon’s first surgical case as a new staff physician. The anxious patient had lost a large volume of blood from an active arterial “bleeder” arising from one inferior pole of one tonsil. Digital pressure was maintained while the patient was rapidly taken to the operating room, as the ER, in one of the country’s largest medical centers did not have a RF electro-surgical generator unit for cautery. The national reported average for post-tonsillectomy bleeding is 2 to 20%. Once transferred to the OR, he used the RF cautery to seal the 3 mm vessel. Clearly a simple, affordable, use-once cautery device stocked throughout the hospital & available in the ER could have averted this patient’s urgent return to the OR. This same problem regarding the lack of a cautery machine to seal and cauterize blood vessels continues to be the norm in hospital ERs throughout the US today. The Electrosurgical Generator capitalization costs & maintenance overhead continues to limit wide access to a cautery solution. A new, simple disposable, light weight, battery powered, thermal cautery forceps design could have easily sealed the hemorrhaging vessels & averted the difficulty Dr. Herzon encountered in the ER as he treated his patient. However, until lighter weight lithium chemistry batteries were invented & silicon nitride ceramic heaters were developed, the vision of a simple solution was impossible. Finally, a solution can now be brought to market using the successful combination of two new technologies, lithium polymer batteries & special ceramic igniter/heaters. The desires of a surgeon are now made a reality with the patented, game-changing THERMOCEPS™ cordless cautery forceps. Our awarded patent portfolio describes allvariations of the revolutionary, solution to seal any blood vessel using a vascular forceps to grasp heat and seal vessels & tissue. The THERMOCEPS™ thermal cautery technology is protected by four, broad based, issued patents; nos. 6,235,027, 6,533,778, 8,128,623 & 8,409,199 issued as recently as April 2, 2013. A new USPTO patent application has been filed to maintain amendable status and broaden our issued claims. The THERMOCEPS™ patents and digital medical value added trade secrets allow a company to either enter or compete more effectively for a larger share of the over $1.9 billion electrosurgical marketplace. As the THERMOCEPS™ can be configured for full battery operation requiring NO external electrical supply, the device is well suited for sales in emerging global medical markets and all branches of the military.